Be it experienced or fresher, when you apply for the job you need to prepare for your interview. But what do you need to focus on is your knowledge or how you can use that in practical? Today the employers are looking for assets who can innovate, lead and have a personality to showcase their company. The interview questions are not restricted to your knowledge but on how you can execute that knowledge innovatively and lead a team with strong personality. Workplace is not a written exam, where you pen down your textbooks as it is to get the perfect score. You will have new challenges which you might not have faced before and you would have to innovate your solution to jump over the hurdle. You should be able to innovate yourself to the new technologies to benefit your company in the future. You need to innovate processes to help your company function better than before. Innovation is what the employers are looking for and the candidates get grilled to raise the curtain on “What innovation they are”. 1. How are you adapting your work to changes in your industry? You can showcase the latest certifications that you have done based on the technology update. You can mention on who were the first to implement a project with a completely new technology setup. Highlight the implementation and the success. Highlight the fact that you are eager to learn while you work and are curious on how your industry is changing. You can also mention about the accolades you have received in your present/previous company in this regard. 2. Can you explain on how you launched your product or service? Mention the products or services that you have launched recently. Explain in few words regarding the process or the product. Give an idea of the marketing campaign that you followed and also mention the reason why it was a success. Show that you are a team player and worked with the team towards getting high revenues. Give them statistics on how well the product or service did with profits or revenue generation. 3. How would you create financial projections for a new product? This is how an interviewer is planning to check on your strategic imagination level. Lisa Bodell, a famous innovation expert and author, had defined strategic innovation as the ability to think and imagine but at the same time finding the bandwidth to execute the creative idea into revenue generating machine. Interviewer might give you an example or a situation, which you will have to analyze and create a solution sitting on the chair. Take your time, and do not hurry into giving out instant solutions. Review what you want to say in your head and then speak out once you are confident on your creative idea. 4. Do you have the eagerness to identify opportunities to grow within the organization? You need to portray yourself as creative as well as challenge accepting asset for the company. They are looking for candidates who have the capability to understand what the client wants or how he operates his business. Can you fish out an opportunity from his business for your organization and give him a creative solution that the client cannot reject? You have to give them examples or explain your expertise in analysis based on the situation that they offer. They are looking for candidates with microscopic analysis who do not fail to lose onto any opportunity. 5. How do you see yourself three years from now in the organization? They would like to know how you can foresee yourself in the coming years. The employer wants to know how aware you are of the industry market trend. When you say you are in sync with the changes happening, this question is most likely to hit you next. Do a thorough research and be sure on what your position can offer in the coming years to the organization and to yourself. They are scrutinizing the vision you have based on the market analysis. An organization wants to know whether you have the talent to Lead. You need to have the zeal and strength to lead a ship to its destination. You need to be the guide as well as the team member to help your team achieve its goals. You have to lead with example and not like a politician who just sits on their chair ordering around but does nothing. 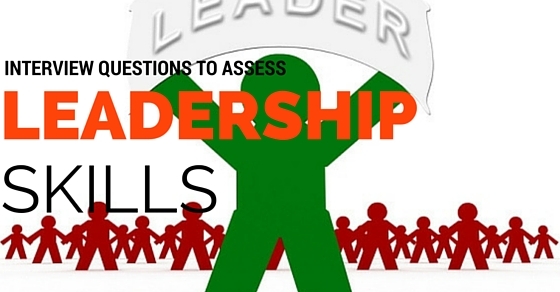 Following questions are some examples on how the interviewer assesses your ability to Lead. Highlight your contribution towards your team and the vital role you played within. You should put stress on your expertise and how it helped in sailing the ship through the storm. You need to showcase your team player attitude where you can mention how you and your team worked to achieve success. If you received any accolades or awards for your expertise and leadership, do mention that also. 2. How would your peers describe your leadership style? What are your strengths and weaknesses as a leader? How do you rate yourself as a leader and why? Please make sure that you do not over-portray yourself and diminish the chances of clearing the interview with flying colours. You need to be real, this is like a self-appraisal. You need to say the truth as the other person sitting across the table has all the senses on alert and can identify your lie. Mention your strengths first, create positive impressive answer followed by what you think your weaknesses are. You can emphasize on how you learnt from your mistake that helped you to become a better leader! This is a classic question which an interviewer will ask to know whether you have the capability to save a sinking ship. Your answer will showcase how reliable you are in difficult times and can you help the organization by turning a non-functional project into profitable returns. If you have a strong story to back this question then there are no issues for showcasing your talent to lead. Even if you have worked on a small project and helped to execute it then you need to make it sound big. You need to clearly mention what was the issue with the project and how you saved the day! 4. What strategies have you used in resolving a conflict within the team and project? Being a leader means that you need to resolve any personal or project related conflicts to ensure that the team is functioning to its full potential. Every leader has his or her way of resolving conflicts and this question is to find out how you do it. Emphasize on being a good listener, a leader who can be approached easily and can work with the team to resolve the conflict. Good leader is also a good team player. This is a classic case to showcase on how good you are in communicating. As a leader you need to believe in yourself and make other believe in what you have to offer. Give an example with statistics on how your strategy helped in the smooth operation of the project. Mention clearly on what you thought and what the manager thought about the situation and how you persuaded your manager to implement your idea. A good leader knows how to get what he or she wants. To be a good leader you need to have a strong personality. A personality that demands respect and owns up the space, in which he or she stands, is a leader. You will face numerous situations, good as well as bad, and if you do not have the personality strength then it will be very difficult for you to drive a team. Even if you have the right technical skills but weakened personality then you will always end up in doing what you are not supposed to do. You will be wasting company’s resource as well as its time. It is easy to nod your head and say YES to everything that comes in your way. But the word NO is what sets you apart. If you can say NO to work which is not relevant to you, no matter what your position is, that candidate has a fair chance of doing well. There is no harm in helping out people, it is a quality that the organization looks for, but at the same time you should have the courage to say NO when it is needed. Give examples of situation where you had said NO and justify it. Portray yourself to be a helper but at the same time no one should take you for granted! You need to be real and honest on what you think a perfect job is. If you create over-expectation then it can work against you. What the interviewer is looking for is whether you fit in the team based on your expectation and what the organization has to offer you. This classic question can make or break your interview process. So, be careful on what you have to say, be honest and you will pass this hurdle too. 3. Are you an organized person? If so, then what are the techniques or tools you use? How you organize your work is how you fulfill your commitment. If you are disorganized person, then your work result will not be up to the mark and you would have a heap of pending items on your desk. An organized person delivers on time and that is what every organization wants at the end. Explain your process of organizing your work. You can mention the tools that you use to make sure that every work assigned is completed and submitted on time. 4. How would your best friend describe you? It is highly unlikely that you know what your best friend thinks of you and how he or she would describe you. But you need to answer this question based on what you feel you are. An interviewer will get insights into your personality based on your answers. Be truthful, honest and reveal your passion and compassion as both are an important aspect to the organization. Interview questions to access your innovation is to know how creative you are. Interview questions to access your leadership is to know how well you can be a captain of the ship and lead to the shore. Interview questions on personality are to know you better and how you fit in with the organization. Each phase of the interview is related to the organizational values and test whether the candidate can adapt and fit in easily. On that note, Good luck.